This season has been my first attempt with a recurve. I've bow hunted for about 20years now and this whole trad thing has really taken me over. My first ever deer or anyting for that matter was a small 8pt in charles county Md. I shot with my Checkmate recurve in September. Then this evening (Dec. 12) I was able to put a small doe down with a good double lung shot at about 9 yards. That makes two deer down for this year with the recurve. I'm hooked thats for sure. 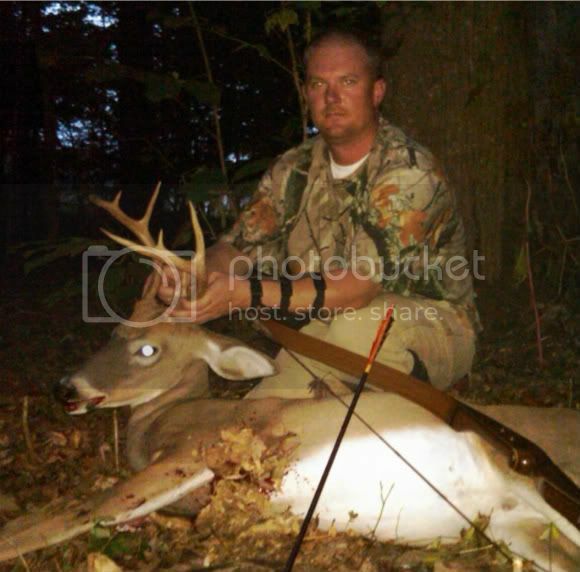 Now I'll be heading to Maryland's eastern shore to chase the elusive sika deer with the recurve for late season. Keep us posted on the sika deer too. Been interested in chasing them! nice buck, love the picture!!! Congrats and good luck on the Sitka deer, hear they are tough!